St. Simons Island homes at Frederica are nearing completion. Expected to be complete and available for move-in by the end of April, these beautiful homes are perfect for vacation homes or to live in year-round. These two available homes are located on the lake providing breathtaking views and convenient access to lake activities such as fishing and boating. The Glynnlake home is priced at $894,418 and showcases four bedrooms. 4.5 bathrooms, a spacious dining/family room area with sweeping 12 foot ceilings and a large screened porch perfect for enjoying the sights and sounds of nature at Frederica. The Southerland home is priced at $922,109 and offers four bedrooms, 4.5 bathrooms and amazing outdoor living with a large terrace and vaulted screen porch. In addition to the two available homes, two additional homes are under contract with more homes starting soon. With homes priced from the high $700,000s, Traton Homes is offering buyers an opportunity to purchase their dream home in this acclaimed club community at a price point that has not previously been offered. Traton’s Frederica homes are designed with lowcountry influences with most homes located on the lake or with lake views. Exteriors showcase warm color palettes of Hardi Board siding with board and batten and brick or stone accents. Well-designed open interiors are perfect for southern entertaining with gourmet kitchens, spacious family rooms and outdoor living spaces. 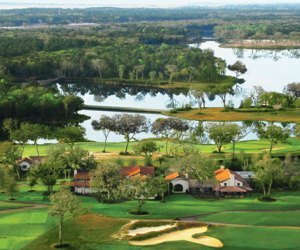 A membership to the Frederica Golf Club provides homeowners with access to an unparalleled amenity package that includes an acclaimed Tom Fazio golf course, renowned golf practice facilities, golf learning center, 35,000 square foot clubhouse, boathouse, outdoor swimming pool, tennis courts, well-equipped fitness facility and an equestrian center. Additionally, residents can explore the island with convenient access to the St. Simons Island Lighthouse, the Bloody Marsh Battle site and Fort Frederica National Monument. Of course, their is also the beach, fantastic shopping and delicious local dining to enjoy. Frederica is just 35 minutes from Interstate I-95 and is a five hour drive to Atlanta and 90 minute drive to Savannah.